I recently read a book and hated it. I’ve been sour ever since. For weeks now, I’ve been miffed, not only because I didn’t like it, but more so because I expected not only to like it, but to LOVE it (based on my obsession with the other books in the series). Of course, as is my nature, I’m mad at the author, as though he let me down by writing the book against my wishes. That’s absurd, since I’m sure we can all agree that it’s 100% MY FAULT that I went into reading it with certain expectations. Usually, when I really hate a book, I put it down and walk away, never wasting another minute’s time thinking about it. However, I clearly can’t shake Iron Gold. I feel like I need to know why I didn’t like it. I can’t even pinpoint whether I owe it to myself, Pierce Brown, or the series as a whole to figure out exactly why I disliked this book. Even now, I hesitate to say that I “hated” it. The feelings while reading were undoubtedly hatred, though. I genuinely didn’t enjoy a single page, but to say that I hated it feels too strong, too personal, especially considering my utter adoration of Brown’s three other novels. So here I sit, racking my brain in the sake of fairness, trying to isolate the reason why this novel missed the mark, so to speak. What makes a person hate a book? Simple Preferences: This can encompass things like genre, POV, format, etc. This is the most frequent reason for me to abandon a text due to dislike. Although I do my best to try various genres (especially ones that might help me recommend books for students with varying interests and preferences), I have very clear preferences of my own. I tend to lean towards Mystery/Horror, Historical Fiction, True Crime, and Sci-Fi, especially “Space Operas.” I do not like romance and I often find realistic fiction and non-fiction to be boring, too much like real life and too little of an escape. If a book falls outside of my standard genre, it is that much more likely to be abandoned due to dislike. Similarly, a lot of people are turned off by a format other than prose. Remember how many people freaked the eff out about Cursed Child being in a screenplay format? If readers get too stuck in our ways, we can easily find anything “abnormal” to be unlikable. Writing Style: Somewhat less common of a cause for abandonment is a dislike for the author’s “voice,” or writing style. As with the others, this is entirely subjective. I recently read a memoir and simply hated the author’s voice, feeling that the whole memoir was a humble brag. While I found it off-putting, my students related to it and thought it was honest and exciting. Similarly, while students are often overwhelmed by Shakespearean language, I find it to be refreshing, challenging, and illuminating. What causes some great pleasure causes others to run and hide. Life: Now that I’ve had some time to think back and really force myself to separate my feelings from what I had expected from this novel, I’m realizing that I just was not in the right frame of mind for this novel. As I recently explained in a recent post, I’m navigating some new and uncomfortable life circumstances right now, and my quick solution is to avoid anything that increases my stress. Undoubtedly, this novel added to my stress. I’m far too invested in these characters and this series to not take these changes personally. It’s entirely possible that this novel would be more welcome during a less stressful time in my life. 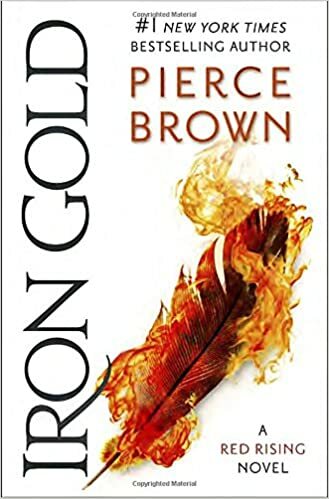 Therefore, I plan to re-read Iron Gold this summer, when I’ll be more removed from the everyday stress of teaching and I can afford to take on the struggles of fictional characters. In addition to re-reading this summer, I also hope to meet up with my like-minded pal Bekah and record another 5-star episode of SPACE BOOKS! There will be plenty of time to mull over my feelings from this first reading (don’t worry, I’ve recorded them so I don’t forget my initial reactions) and potentially adjust them based on research, discussions, and re-reading. What I can say, though, is that I also finished reading the Sons of Ares comics. I highly enjoyed them, although I must say that I hate being done with the experience in 5 minutes flat and feeling like the comics left me with more questions than answers. All the same, I’d highly recommend them.